Dozens of Unicorn Startups have sprung up in China over the past years. Southeast Asia, where the market is massive and the economy is vigorous, is now cultivating similar opportunities. 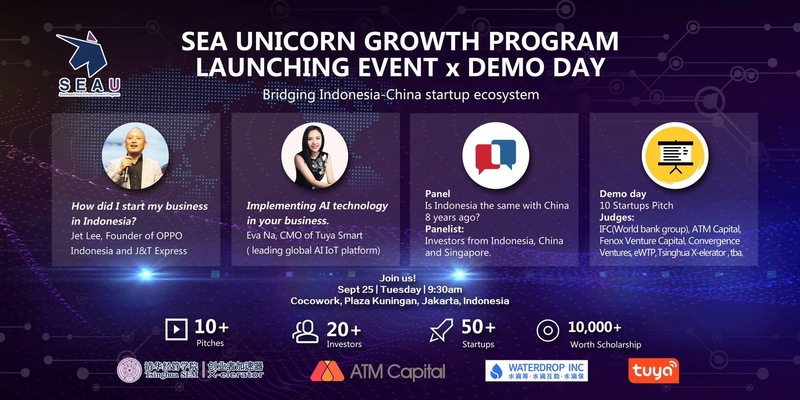 Tsinghua SEM X-elerator and ATM Capital join forces to initiate Southeast Asia Unicorn Growth Program to discover and shape the future tech giants in SEA, thus contributing to the entrepreneurial ecosystem in the region. We are hosting this launching event to bring together people from startups, internet giant companies, VCs and educational organizations, aiming to build a community where they can exchange ideas, learn from mistakes and gain partnerships on top of China and SEA ecosystems. Founder and CEO of Waterdrop Inc. This event is pre-registration only, walk-ins are not allowed. Please make sure to register if you want to attend the event. ATM Capital reserves the right to turn away walk-in attendees at the door. Learn, socialize and have fun! This program is initiated by Tsinghua University SEM X-elerator and ATM Capital. We join forces to discover and shape the future tech giants in Southeast Asia by building community, providing Education from 50+ top mentors in different industry, in-depth visits/connection with China top internet companies, and funding for potential startups as well. Mentors from varying fields including scholars, investors and entrepreneurs are carefully selected for this program, in an effort to benefit the startups in terms of management, techniques and strategy. This program offers our startups a precious opportunity to visit the unicorn companies and receive constructive advices from the specialties in Star Enterprise like Meituan and Tencent. Our startups are offered a face to face opportunity with the best venture capitals, which allows them to demonstrate the feathers of their projects and gain the chances for fundraising. For more detailed information, please attend our launching event at Jakarta on September, 25th to learn more!